What do the best payroll companies offer? Why choose online payroll services? Find out below. What is Full Service Payroll? What Payroll Features Do I Need? Should I Outsource My Small Business Payroll? Full Service Payroll is our simple and affordable small business payroll solution. Small business owners have enough on their plate without having to keep up with entering employee wages, tracking time and attendance, monitoring changing tax rates, running payroll and safekeeping human resources documents. With Full Service Payroll, we deposit and file your federal, state and local payroll taxes for you so you can get back to business. We determine which payroll taxes are necessary for your business, so don‘t worry about payroll tax filing deadlines. We guarantee to file and remit your payroll taxes on time. Plus, we handle any correspondence with government tax agencies. While 99% of our customers have employees in one state, you can also run payroll in other states for an additional $12 per month, per state. Full Service Payroll starts at just $30/mo + $4/mo per employee. Unlimited payrolls every month. You can run payroll at any frequency you need to, whether weekly, biweekly or monthly. Complete tax filing and depositing. Small business owns constantly rank the tax burden as their number one stressors. Stress no more! We’ll file and deposit your payroll taxes, and you get guaranteed accuracy and security with Full Service Payroll. W-2s, W-3s, 1099s, Workers’ Compensation Insurance — tell us what you need. Free direct deposit. Payday is no sweat — you can pay your employees using direct deposit, cash or paychecks (printed or handwritten) thank to our small business payroll. Free employee portal. Your employees can securely access their pay stubs, payment history and other payroll information with our small business payroll solution. Free setup and U.S.-based support. Switching payroll providers (or using online payroll services for the first time) is simple with TransNational Payments. We offer FREE Full Service Payroll setup and our friendly support team is available by phone, email or chat. No lengthy contract. Full Service Payroll is month-to-month and user-friendly. Plus, our FREE 30-day trial gives you plenty of time to set up your payroll portal and test out our services! No obligation and no strings attached. Our payroll price is the one to beat. See for yourself! Full Service Payroll is easy to use — no downloading or updating. One of the great features of our online Full Service Payroll software is that because the service takes advantage of cloud computing technology, there’s nothing that you need to download, upload, anything. With our payroll software, all updates are automatic! You don’t need to worry about backing up your payroll data on your own hard drive. If your computer fails, your payroll data is still safe with us. Run payroll anywhere you are. Cloud computing technology also makes it convenient to run payroll anywhere you are. So for example, if you forget to run your weekly payroll at the office, you can still pay your employees from the comfort of your living room with our payroll software. Your employees’ information is secure with Full Service Payroll. We take the security of your data seriously. With Full Service Payroll, we protect your data with an SSL encryption process (secure socket layer encryption), which banks and credit card companies also use to protect customer data. Download the Full Service Payroll One-Sheet. An easy-to-share overview of Full Service Payroll pricing, features, benefits and add-ons. Time & Attendance Software and Human Resources Software integrate seamlessly with Full Service Payroll; they are not standalone services. When you add Time & Attendance Software to Full Service Payroll, your employees simply clock in and out online via time punch or manual entry, then send completed time cards to you for review. On payday, you can approve your employees’ time cards then send them to payroll with the click of a button. When you add Human Resources to Full Service Payroll, you can upload important company documents one time, and then your employees can access them anytime. Our software automatically keeps your emergency contacts, notes, job title changes and dates safe and organized. Stress-free Full Service Payroll is one click away. Enjoy the best price for all the payroll features you need. Does your head hurt when you think about the fact that you have to deal with all the legal and regulatory changes that occur in payroll processing each year? Do payroll taxes, wage calculations and other administrative burdens stress you out? As a busy merchant, why should you spend your time running repetitive payroll calculations, managing timecards and keeping up with Human Resources documents when someone else could do it for you? The valuable time and energy you typically spend figuring out how much money you need to pay your employees could be spent actually making money. The freedom to focus on other, profitable areas of your business shouldn’t cost an arm and a leg. We offer Full Service Payroll starting at $30/mo, and that price includes 1 employee and 1 FREE month of payroll. Even if you’re a hands-on kind of business owner, keeping up with running payroll and constantly changing federal, state and local taxes can become a full-time job. Working with a professional payroll provider could be the best investment you ever make. Errors in bookkeeping as they relate to tax issues put many businesses in trouble every year. In fact, according to an article by Inc.com, the IRS penalizes about 1 out of 3 business owners for payroll tax errors. It’s the number-one pitfall of handling payroll processing in-house because every year, federal, state and local tax rate fluctuations increase the likelihood of errors unless you’re immersed in the world of payroll processing on a daily basis. Time-savings and peace of mind is available: try Full Service Payroll. An experienced payroll provider will handle your business’s daily needs as well as offer features like direct deposit, tax filing and depositing, an employee portal, time and attendance solutions, Human Resources services and more. The options are endless, but a reputable payroll company will also work with you to understand what combination of services is the right fit. For example, you might need to send 1099s, provide Workers’ Compensation Insurance, manage employees in multiple states, or pay some employees with checks and others via direct deposit. You can do all of the above with Full Service Payroll! Jump to: What Payroll Features Do I Need? You need to hire a payroll service company that you can trust with the sensitive personal data involved in running payroll, calculating payroll taxes and other Human Resources documents. To do so, look for an established payroll company, backed by great reviews, strong history, client testimonials and a solid industry reputation. If all 4 of these characteristics are present, you’re probably with the right payroll service company! Don’t wait — Full Service Payroll is THE small business payroll solution. Full Service Payroll is easy & affordable with TransNational Payments. Let us handle your payroll taxes so you can get back to business. Popular payroll providers abound, but popular does not equal cost-effective. For most small business owners, the decision to outsource payroll all comes down to the most money and time saved. So why are so many merchants overpaying for payroll? With Full Service Payroll, not only can you run payroll in minutes, but you’ll save hundreds compared to other providers. Do you run multiple payrolls every month? Your savings could be even greater! Tax and payroll services are the two most commonly outsourced finance and accounting functions. In fact, according to a recent report by Robert Half, nearly one-third of U.S. small businesses with less than 25 million in volume outsource both. Today, there are too many in-house payroll apps and programs to count, and you still need to assign an employee or a team to manage it … or you end up doing it yourself. Crunching numbers and filing taxes eat up time which owners and staff already don’t have enough of. Unlike some other small business stressors, this is an easy fix. By outsourcing your payroll, you can shift that time and energy to knocking out your other to-dos, big and small. Want quick proof? Try our Full Service Payroll free for a whole month and see exactly how much time you could be saving. Run payroll in minutes anytime, anywhere. Payroll is a repetitive, tedious and time-consuming activity that doesn’t help generate money or new customers — sounds like every business owner’s dream, right? If not, outsourcing payroll is an inexpensive option that gives you all the tools and benefits of full-service processing without having to slog through payroll taxes or spend time calculating wages yourself. Our user-friendly Full Service Payroll is just $30/mo (includes one employee) and $4/mo per employee. Plus, we’ll set up your software for free. Small errors have major consequences when it comes to payroll taxes. An inaccurate form, late filing or incorrect math can mean penalties, fines or worse. With constant rate changes and updates to tax laws and government regulations, you don’t want to be among approximately 40 percent of small businesses that face an average of $845 in IRS penalties every year. A reliable payroll company will not only ensure that everything is done right the first time, but also take responsibility and help resolve any issues that may come up down the road. When you sign up for Full Service Payroll, we’ll file your federal, state and local payroll taxes, and we’ll cover any penalties or interest if we make an error. Any type of payment processing involves risk, but outsourcing your payroll to an experienced organization reduces it significantly. Reputable payment processors, like TransNational Payments, operate according to the Payment Card Industry Data Security Standard (PCI DSS) which ensures safe storage and handling of all sensitive data. Your financial data is encrypted and securely stored in the cloud when you use Full Service Payroll — and because our servers constantly back up your information, you don’t have to worry about a computer crashing or lost or damaged documents. Some small businesses prefer to keep their payroll and tax management in-house because it gives them flexibility. Outsourcing payroll, however, actually provides more control over your payroll in most cases. A good provider will let you manage your payroll 24/7 via an online portal, support free direct deposit and let your employees access their own pay stubs and W-2 forms electronically. Full Service Payroll does all of this and more — it offers unlimited payrolls, accurate tax filing and timekeeping and human resources software add-ons. Thinking about saving money and time on your next payroll? We'll calculate your payroll savings! "In small business, we are told you get what you pay for. That is a lie. I am getting way more than I could have dreamed. I am absolutely amazed. The software is easily half the cost of any other option out there. It is absolutely unreal. Your service has continually blown me away. I wish everything in life was as easy to get started and get help with." "I already work between 60 to 70 hours a week. This software saves me a ton of time and money not having to file my payroll taxes every three to four months on my own. It eliminates a lot of stress and headaches and is well worth the price." "The software is excellent for what I need it to do. We are a very small company and do not need any of the big fancy bells and whistles. It’s great to have access to all of the data online so I do not have to save and back up the files and risk losing them." Save time and money in 2019 like these merchants! Payroll doesn't have to be stressful or time-consuming — get your FREE month today. While small business owners have many options when considering how to pay employees, the complexity of payroll these days really makes old-fashioned ledgers and tax tables a poor solution. Even a small business needs a “payroll system” in order to satisfy all the regulatory requirements. You can outsource payroll to an accountant or payroll company (which can be expensive), or choose to handle the task on your own. What about payroll tax filings? Here too, an employer can entrust their payroll providers to handle the payroll tax filing tasks, or you can choose to handle these tasks yourself. So how do you choose? What is a payroll system going to include that is the most efficient, and cost-effective? Chances are, you are going to end up selecting either online payroll software or a Full Service online payroll option. In the past, a payroll service might print and deliver paychecks to your business. But now, many small business owners save time and money by using Full Service Payroll and direct deposit. Full Service Payroll options now have the convenience of running payroll online and offer a hands-off solution for filing federal, state and local payroll taxes. Employers can choose to use payroll software. You enter the time details on your own, and the software calculates the paychecks. You can then print the checks or send them via direct deposit. 1. Full Service Payroll can be the least costly option for a small business when considering the time saved for filing payroll taxes. 2. Federal, state and local taxes are filed on behalf of your small business with the Full Service Payroll option. 3. Full Service online payroll systems can provide automatic updates and the convenience of processing payroll from any location 24/7. Payroll software can be an affordable option. With payroll software, you are in control and can process payroll on the fly. Payroll software may have online access. This can be particularly helpful for small business owners who may want the convenience of online access from any location. 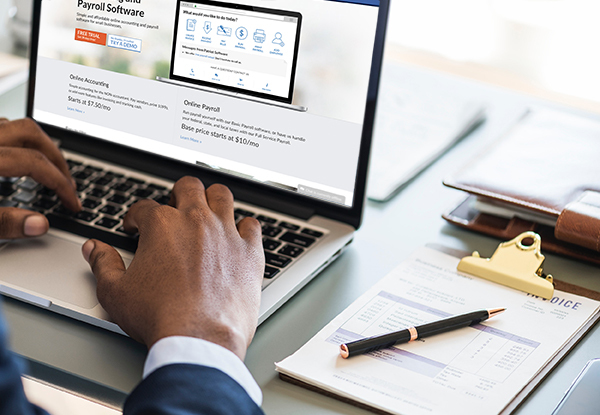 Online payroll software can be automatically updated which means you don’t have to worry about installing updates to keep your software current. 1. Ultimately you are responsible for your payroll tax filings. Solution! Be sure you are dealing with a reputable company with a good rating from the Better Business Bureau. Payroll providers, like TransNational Payments, should be able to provide you with reports of timely tax filings. 2. Some Full Service Payroll options may have setup costs and charge significant support fees, but TransNational Payments’ Full Service Payroll has free setup and expert support. Solution! Make sure when you sign up with a payroll provider that you are aware of any additional fees upfront. The cost of Full Service Payroll may be more expensive than other basic payroll options (in which the provider does not handle your payroll taxes) but you’ll save much more time. 1. Some payroll software is designed for experienced accounting professionals. 2. Fees might be imposed for cancellation or support. Solution! Before signing up, be sure to read the fine print and find out if there are a long-term contract and/or cancellation fees. 3. You are responsible for payroll taxes. You need to compute payroll taxes and make sure that all forms and payments are completed accurately. Solution! Be sure your payroll software offers free reports that clearly show the number of your payroll tax liabilities (… but filing on time is ultimately your responsibility). 4. Forgotten payroll tax payments (or paperwork mistakes) could happen and can be costly. Solution! Consider using Full Service Payroll software. Some small business owners find that they do not have the time nor the expertise to handle payroll taxes. In that case, you may choose a Full Service Payroll option. The right provider can save a small business owner more than 100 hours of time each year! Full Service Payroll vs Payroll Software. You will want to carefully weigh the pros and cons of each option. For example, although the payroll software may cost less, will the “cost” of time to compute and the penalties for possibly late payroll tax payments make Full Service Payroll a better option for your business? Hidden fees. Before committing to a payroll method, you will want to carefully consider the fees for cancellation, customer support, setup, etc. Consider levels of service. Is the software easy to use? What customer support is available? For Full Service Payroll, how do you record employee hours and review the amounts paid? If you’re searching for online payroll software for payroll service providers, does the program have affordable rates? Updates are critical. You need to be assured that payroll tax tables are timely and up to date. Many online payroll software options have automatic updates. Updates on software that has been downloaded will be your responsibility. Evaluate the payroll providers. Check all payroll providers for complaints with the Better Business Bureau, no matter what decision you make. Questions on whether Full Service Payroll is right for you? We can calculate how much you'd save with Full Service Payroll. Start your FREE month of Full Service Payroll!